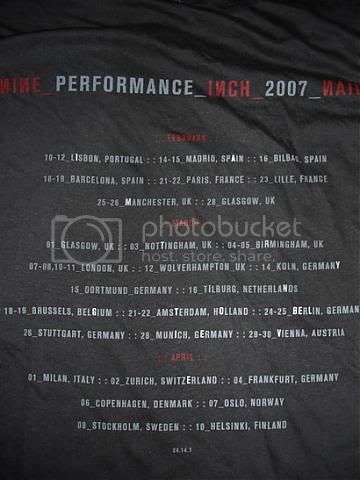 On the back of a new NIN Tour Shirt, some of the letters are highlighted. These letters form the phrase "I AM TRYING TO BELIEVE. "Using this information, fans discovered that www.iamtryingtobelieve.com is an actual site. Full ninwiki page for banned media references at Year Zero Banned Media. According to both a statement from Trent Reznor and an image clue from The Year Zero Website entitled "I Am Trying To Believe", Year Zero occurs in 2022. The faded image to the left of the main article shows the date "2022", yet the article itself is reduplicated and clearer, showing the date "0000". "Concept record. Sixteen tracks. What's it about? Well, it takes place about 15 years in the future. Things are not good. If you imagine a world where greed and power continue to run their likely course, you'll have an idea of the backdrop." On the "Church of Plano" Website  under the heading "This Week's Sermons:", the date reads Sunday, February 13. Coincidentaly, February the 13th falls on a Sunday in the year 2022.
has led to improvements in our infrastructure!" Members of the community have noted that the burst of static at the end of the My Violent Heart and The Warning strongly resembles what has become to be known as The Presence when run through a spectrograph. "nohurry.mp3" (here) is one of the three (so far) mp3s linked to on the Another Version of the Truth forums. It is about a son of an Imam who is killed by a SWAT team looking for a Muslim extremist. "opalo.mp3"  is one of the three (so far) mp3s linked to on the Another Version of the Truth forums. It is a woman talking about a DEA battle with a Columbian drug cartel. ballgameOver.mp3 (here) is one of the three (so far) mp3s linked to on the Another Version of the Truth forums. The mp3 is a recording of a man (presumed to be "Angry Sniper") giving a lesson on recommended methods and best practices for conducting effective acts of rebellion, whilst simultaneously carrying out such an act. He laments the difficulty of getting a message and news coverage of revolutionary acts out to the people due to tight government restrictions on the media. To work around this, he conducts his operation at Wrigley Field during a live televised baseball game. He explains how he cheaply displayed his written message to the ballgame attendees, and then reveals that he has planted bombs of Silver Nitrate around the stadium and is stationed in a rented apartment across the street from the ballpark. Once his message is seen, he detonates the bombs. In the ensuing chaos, a prominent religious leader steps up to give a speech of promised retribution. Anticipating this, the man uses a sniper rifle to assassinate him on live television. This page was last modified on 3 December 2009, at 09:24. This page has been accessed 113,231 times.